Written by Dylan Deppe. Media by Jon Friedman. 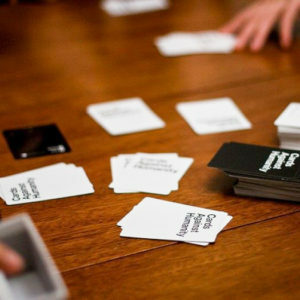 “Vigilante justice,” “edible underpants,” “fiery poops,” and “a home video of Oprah sobbing into a Lean Cuisine.” Those are some of the cards you might pull if you play Cards Against Humanity. 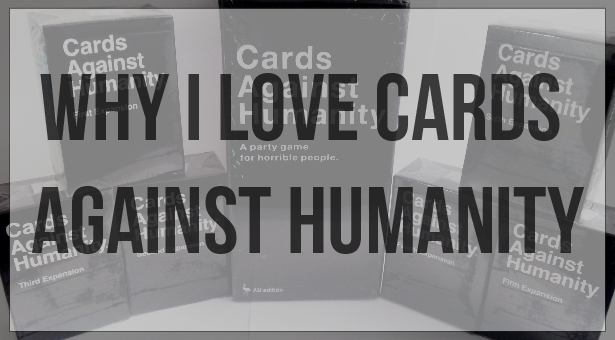 So, what exactly is Cards Against Humanity? It’s a self-described “party game for horrible people” that operates like a dirty version of Apples to Apples. So, besides its cheeky persona and goofy expansion packs, why do I love this naughty game so much? Strap in and find out. Okay, but first, I feel a brief overview is needed. The way the rules work is you get a judge and four to, apparently, twenty people playing to win. The judge pulls a card with a statement or question with one or two blanks, and the people playing put down one of their five to ten cards that they think will beat everybody else’s cards. The judge mixes the cards up, looks over them, and declares a winner, and you do that until you decide the game is over. The rules are stricter than that, with specific rules about how to end, the funny one about who becomes the judge, and the ever-satisfying blank card (where you write what you want). But in a game that encourages you to play cards about STDs and moderate to severe joint pain, I think we can loosen up just a bit. So, now the sauce. Why do I love this game? It’s actually less about the game and more about the people. Sure, playing “dead parents” as “Batman’s guilty pleasure” is a sure way to get a rise out of me (Sshhh, don’t tell the people I play with), but it’s less about what you say with your cards, and more what you say in your reactions. Those are called “tells” in gambling. SideQuest bassist Jacob Kersh said about the game, “I think Cards Against Humanity is a great way to build community because it forces you to understand how people think.” Along those same lines, I watch the way other players react so I can get a sense of what’s fine with them, what crosses the line, and what pushes the border. That’s also a pretty solid game plan if winning is your thing. If you or your friends find yourselves playing it anytime, you might be surprised what your best buds end up playing on you. So, it can be used as a tool for growing a communal relationship, too. I would rather do that than ask someone I want to hang out with how the weather is.